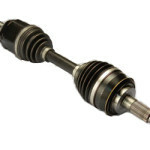 An Axle is a narrow shaft that connects a wheel to the transmission, the transmission rotates the axle shafts, which rotates the wheels. Axles are also referred to as CV axles or half-shafts. Depending on the make and model, the axle is either mounted to a bearing at its base of the transmission and rotates with the wheel or the tire is mounted to a baring on the axle and rotates around the axle. Axle shafts are made of four components; shaft, CV joints, grease and rubber boots to hold the grease and to protect against dirt. Over time axles do get worn out due to friction, overloading, bad carrier bearing or a severe bump on the road. some indications that a car axle is broken are; torn boot resulting in the grease leaking out, clunking or sputtering when you put the car in gear, vibrations when accelerating. Whether the car axle is broken or damaged, our North Attleborough Auto Repair mechanic can diagnose and solve the problem. We have all the tools to get your drive axle fixed right.